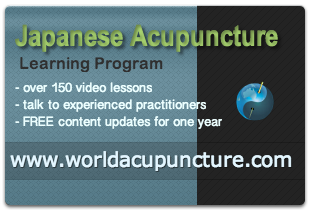 Here we will focus on Japanese Acupuncture to relieve stress and anxi­ety which are rife at the moment. So many people come to our Acupuncture Brisbane clin­ic to seek relief from these con­di­tions. While I’m say­ing this, I’m think­ing what else do people do to get relief from stress and anxi­ety – they take pills, drink alco­hol and smoke. Some under­take phys­ic­al exer­cise which is a pretty pro­duct­ive way to tackle the prob­lem, although in my exper­i­ence it doesn’t always resolve it. Others may use mas­sage, tai chi, yoga, heart ther­apy, listen­ing to music or sound ther­apy – a myri­ad of meth­ods. However, in my exper­i­ence acu­punc­ture is incred­ibly effect­ive in going down and embra­cing the fun­da­ment­al cause of stress and anxi­ety. There are two essen­tial polar­it­ies in the prac­tice of Japanese Acupuncture – the Yin and the Yang. Most people will know of the “Yin”, which is the dark aspect of the circle (used to illus­trate these polar­it­ies), and the “Yang” which is the light aspect. The philo­sophy of East Asian Medicine clearly states that the Yin — the cool, dark or rest­ing prin­ciple — con­trols the Yang, which is the act­ive, hot, expans­ive prin­ciple. The Yin prin­ciple is the con­tract­ive prin­ciple. The uni­ver­sal prin­ciple from East Asian Medicine is that the Yin or the form restricts the ener­get­ic or act­ive prin­ciple and the Yang, the act­ive prin­ciple, ener­vates the form so that it can move. So this gives us a won­der­fully simple but com­pre­hens­ive philo­sophy. If we look at stress and anxi­ety util­iz­ing this philo­sophy, it provides a very clear per­spect­ive. The Yin requires rest and suf­fi­cient sleep and suf­fi­cient time without stim­u­la­tion. When we look at our life­style in the 21st Century, we notice that people turn on their com­puter each day and there is tele­vi­sion 24/7. We have every form of stim­u­la­tion we want to know about at our fin­ger­tips. So with this end­less stim­u­la­tion and work stresses such as pres­sured timelines and uncer­tainty about job secur­ity, it is under­stand­able why people are suf­fer­ing stress and anxi­ety. Today we are deal­ing with a per­form­ance-ori­ented scen­ario – if you don’t make the grade, you are gone. This is a sub­lim­in­al pres­sure – reflec­ted in the need to get to work on time, to catch the bus/train or leave home by car at a spe­cif­ic time to avoid the peak traffic. We are all sub­ject to this and in con­junc­tion with this under­ly­ing pres­sure is the pres­sure asso­ci­ated with our indi­vidu­al per­son­al life­styles (what goes on in our per­son­al lives) – the stresses, the losses and bereave­ment, mov­ing house, mort­gage fore­clos­ures or debt. There are just so many stressors. Also, the media fre­quently seeks to gen­er­ate high anxi­ety as this sells copy – just as they did when Putin was in Brisbane for the G20 and Russian war­ships were seen head­ing for Australian waters. So the bot­tom-line is the Yin, the calm­ing prin­ciple, is dimin­ished at a much earli­er age. Even for our chil­dren, the pres­sures are great – the pres­sure of school, achiev­ing the High School Certificate and the over­all need to con­form to all sorts of cul­tur­al norms. The pres­sure on indi­vidu­als is extraordin­ary. In the aca­dem­ic envir­on­ment, we have the pres­sure on uni­ver­sity stu­dents to get work done in tight time­frames. I see a lot of Honours, PhD and Master’s stu­dents who are suf­fer­ing from stress and anxi­ety. I also see stu­dents in seni­or years in high school – all of them “under the ham­mer” from the aca­dem­ic sys­tem that seems to take great pleas­ure from squeez­ing the very life out of the stu­dents. Excuse me if I am very emotive about this sub­ject, but I don’t see that this level of pres­sure is in the best interests of the human race, regard­less of the level of achieve­ment – the costs emo­tion­ally and envir­on­ment­ally are enorm­ous. The Yin prin­ciple — the cool­ing, rest­ing, calm­ing prin­ciple – becomes dimin­ished, and the Yang prin­ciple – the act­ive prin­ciple – becomes over­act­ive. The Yang acts like a class of chil­dren at school when the teach­er is not there – they just do what they want. So instead of the Yang energy being chan­nelled through the struc­ture or the human body in an act­ive, pur­pose­ful, con­struct­ive and cre­at­ive man­ner, it becomes a very dele­ter­i­ous energy and it erodes at the gut – it causes ulcers, nose bleeds, head­ache, stiff neck and shoulders and RSI. From an Oriental Medicine per­spect­ive, this is the basic under­ly­ing cause behind so many of these inflam­mat­ory con­di­tions. There are also oth­er unhealthy con­di­tions, such as heartache and the inab­il­ity to relax, res­ult­ing from this harm­ful energy gen­er­ated through stress and anxi­ety – and we could go on ad infin­itum to explore the health con­sequences. I am extremely pas­sion­ate about this area – I’m not happy with this situ­ation as it exists in the 21st Century for the chil­dren com­ing through the sys­tem. It is very oner­ous for them and there is no ques­tion about it – I see the res­ults of these stressors daily. Japanese acu­punc­ture restores the bal­ance between the Yin and Yang energy and restores the body to its prop­er ener­get­ic and healthy level. So if you need to gain relief from stress and anxi­ety, please do not hes­it­ate to vis­it our Japanese acu­punc­ture clin­ic in Brisbane or the Gold Coast.